Calms and moisturizes sensitive skin. Reduces redness and irritation. 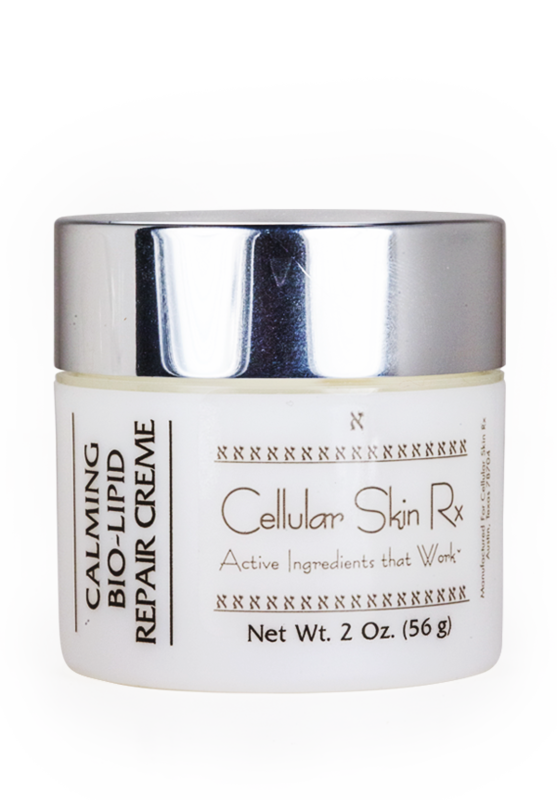 Calming Bio-Lipid Repair Creme uses Rosemary and other lipid-rich ingredients to repair and moisturize skin while Sea Whip and Green Tea Extract calm sensitive skin and reduce visible redness. Soluble Beta-Glucans stimulates skin to form healthy connective tissue over time. Skin immediately feels softer and calmer, stays moisturized for hours. With long-term use, skin will look healthier, become less sensitive and feel more comfortable – even in the presence of irritants that caused reactions in the past. The finish is soft, never greasy or shiny. Sister product Calming Bio-Lipid Repair Fluid provides all of the benefits of our popular creme except in a lighter weight oil-free formula. This fluid formula is wonderful for use during the hotter months of the year when skin needs soothing hydration but not extra oil. Calming Bio-Lipid Repair Creme is perfect for daily use over C+ Firming Serum, SuperMax MultiPeptide Skin Solution Serum and/or ProgeniDerm™ Anti-Senescence Skin Stem Cell Serum. Both Calming Bio-Lipid Repair products are also recommended for use on skin that has recently undergone microdermabrasion, chemical peels or laser surgery. The creme comes in an ultra-generous 2 oz jar. After cleansing, apply as needed on a regular basis. If using C+ Firming serum, Age-Limit Advanced Refinishing serum, and/or Relax-A-Line™ topical serum, may be applied over these products. Allow to absorb completely before applying make-up. I’ve used so many different moisturizers over the years. I can’t believe I hadn’t tried this one since I’ve used a number of CSRx products happily. So, when my last jar of moisturizer ran out, I ordered this. So glad I did! It’s not at all heavy, but it lasts for hours. Also, my foundation goes on beautifully over it. I use it every morning and when it’s winter, again at night. I don’t find it overly oily, so I’ve been using it even in the summer and when visiting hot locales. This is one of the unsung heroes in the CSRx product line.